Love Thirsties cloth diapers? Enter to win one this week from Diaper Junction! 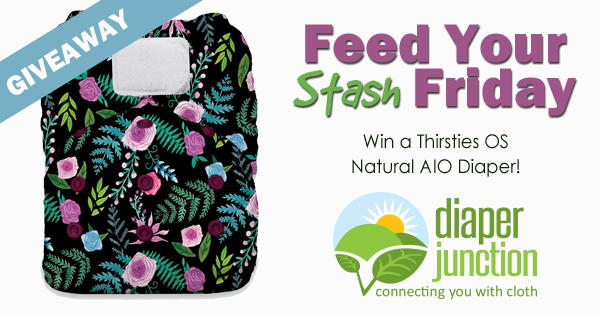 2/2/18 FYSF, Win a Thirsties Natural OS AIO Cloth Diaper! This week we're featuring another favorite brand of ours! To celebrate the upcoming stocking of Thirsties NEW Floribunda print we're giving Diaper Junction fans the chance to enter to win a Thirsties Natural OS AIO in the color, print and closure of their choice from our in stock selection! Thirsties NEW Floribunda print stocks Thursday February 8th! The giveaway. Enter to win using the embedded Rafflecopter form below. This contest is open to the USA and Canada. The winner will be notified by email and will have 7 days to reply and claim their prize. Beautiful print! Would love to add to my stash! The flowers would be nice for the new baby.